Teens Hit the Streets So Kids Can Eat | Kid Reporters' Notebook | Scholastic Inc. It started in 2010, when Scholastic News Kid Reporter Cassandra Hsiao wrote an article about Operation DREAM (Dominican Republic Emergency Aid Mission). The nonprofit organization has shipped more than 50,000 pounds of food to Haiti and the Dominican Republic since 2009. Cassandra, who is my older sister, was 11 years old when she wrote the article. Her interest in Operation DREAM's mission led her to become one of the many young people who are passionate about helping the poor and mobilizing other kids to action. Now 15, Cassandra and her team go door-to-door asking for food donations in California's Los Angeles County. From a small group of 20 in 2011, Cassandra's team has expanded into 100 personally-recruited volunteers. Operation DREAM has prospered under Cassandra’s leadership and guidance. Recently, Cassandra organized the leadership team at her school, the Orange County School of the Arts, for a "Trick or Treat So Kids Can Eat" campaign. They went trick-or-treating for canned foods instead of candy, and the results surpassed expectations. Cassandra hopes to remain a partner of Operation DREAM for many years to come. “Based on the network she has developed, Cassandra is now a full-blown partner of DREAM," George Olivo, the President of Operation DREAM, told me via email. 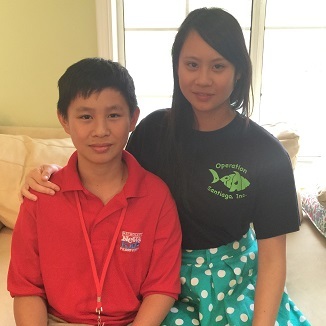 "Cassandra has generated more food for shipment than some of the schools who do hunger-relief drives for us." Operation DREAM works with the Ministry of Blessing Others, an important link to feeding the children in Haiti. The ministry is currently serving a small community in Delaire, Haiti. “Operation DREAM has helped by providing enough food to start a program in the school so that the children can have one meal a day," Keith Davis, the founder of the ministry, told me via email. "In the surrounding area, we are able to feed the hungry." Cassandra calls churches, schools, business owners, the media, and public officials and asks to give presentations on Operation DREAM. All of her hard work paid off recently when her team came together to pack canned goods into boxes to be shipped to Haiti. Olivo agrees. He gives advice to young people who want to make a difference in their community: "Work hard, study hard, ask good questions. Find a need that you are passionate about, and inspire others to help you go after it. Don't be afraid to DREAM big." If you would like to help children in Haiti and the Dominican Republic, visit Operation DREAM.